Merry Christmas one and all! 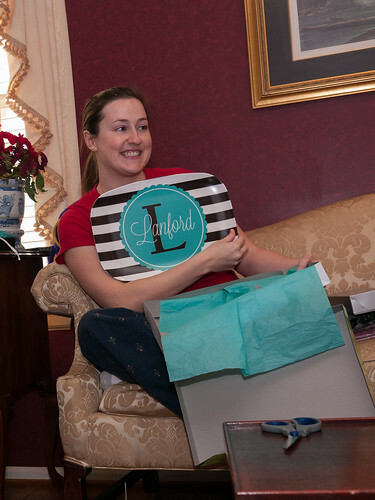 We had a fun and exciting Christmas, including presents and family fun. But let's not get ahead of ourselves. The girls waited patiently until the decided time to go downstairs (7:30), then promptly got us up. 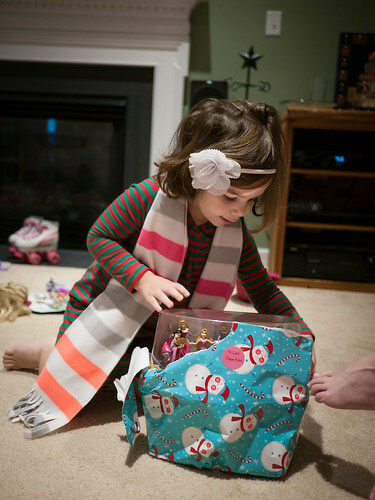 After a rousing chorus of Happy Birthday to Jesus, we found full stockings and presents to open. Santa brought Molly some roller skates, and Leah a pogo stick (yes, that’s what she wanted) in addition to hats, headbands, scarfs, and more. 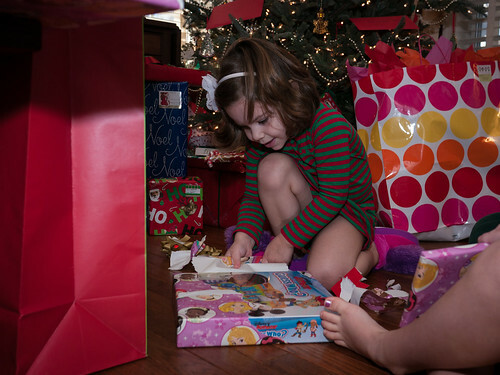 After stockings, we opened some presents. 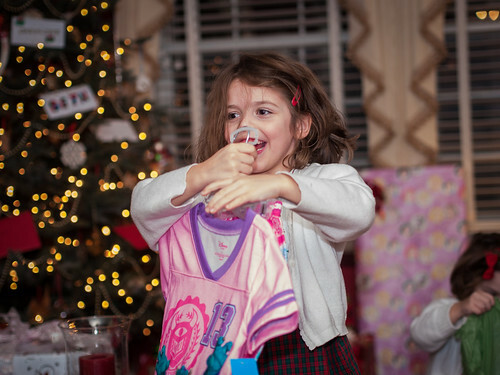 Here’s Leah opening a huge number of princesses. Jen always has project presents for people, but this year I joined in as well. 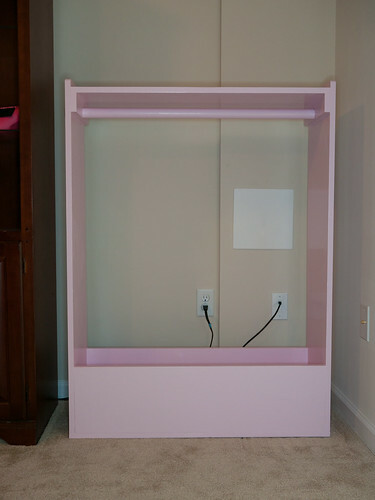 I built the girls this dress-up closet for them to hang their dress-up clothes. 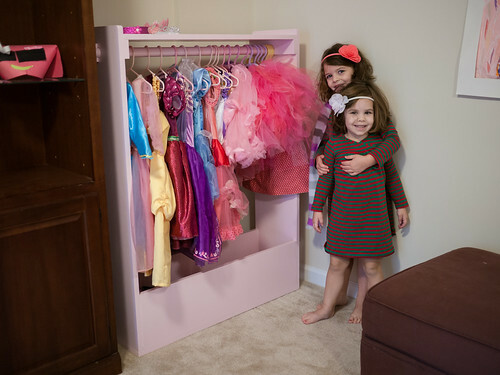 Here’s my project loaded with dresses, skirts, tutus, and fairy wings. They’ve also got crowns up on the top shelf, and shoes and other accoutrements in the bottom. The girls were fans. After opening everything at our house, Molly tried out her roller skates in the front hall. They seem great! 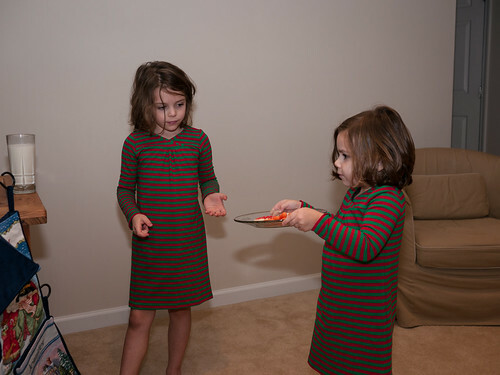 You may have noticed a lot of matching attire between the girls and their dolls. 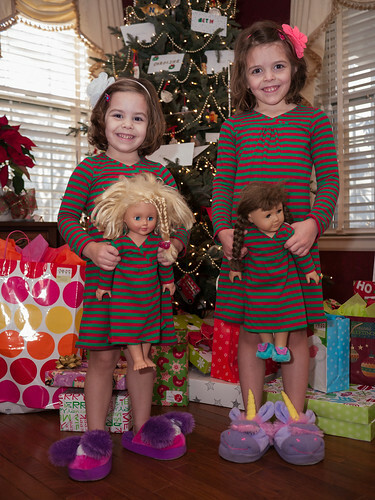 Jen again made the girls and their dolls matching nightgowns for Christmas Eve. 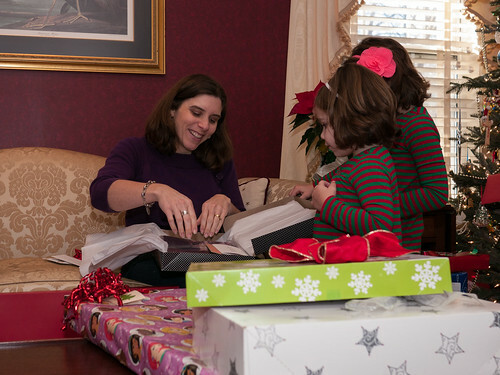 After some breakfast at Grams’s house, we moved on to opening presents there. Leah was excited as soon as she saw the Disney logo on the box. 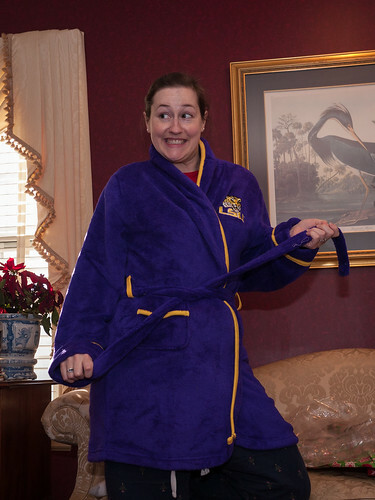 Pajamas were a popular gift this year. 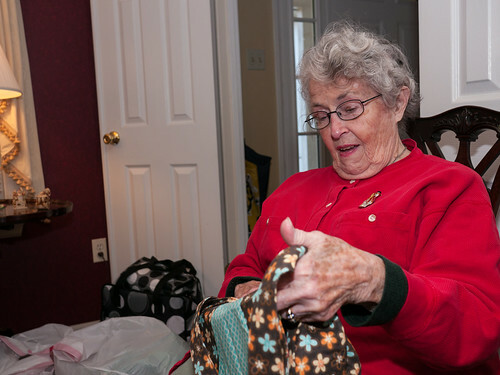 Jen made Grammy a purse customized to her individual needs. Here it is up close. 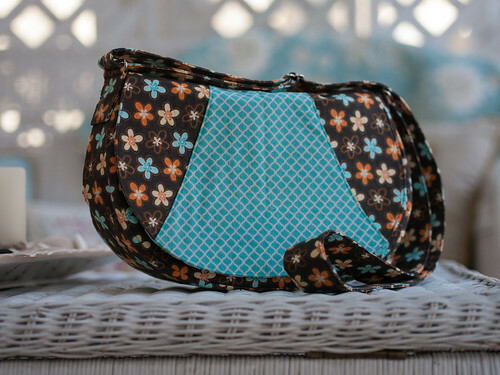 It includes a cross-body long strap, and is Jen’s most structured creation yet. 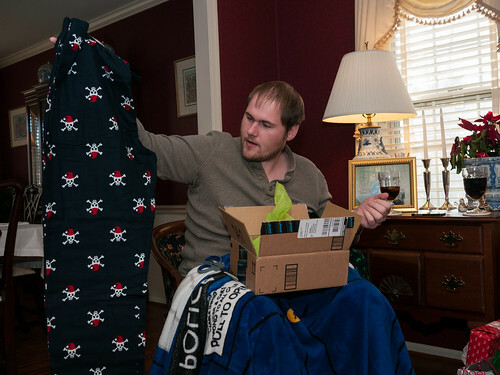 Uncle Scott is quite tall, so most of his pajama pants look more like capris on him. So, we gave him some extra tall pajama pants to keep his ankles warm. We gave Grams a lovely serving plate. Aunt EA and Uncle Scott gave Grammy a card that sang Feliz Navidad. 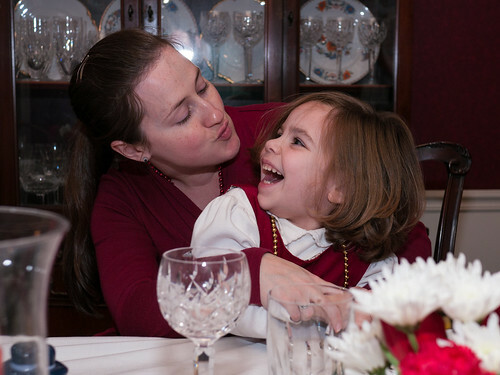 Molly is entertained, and Leah thinks it is hilarious. 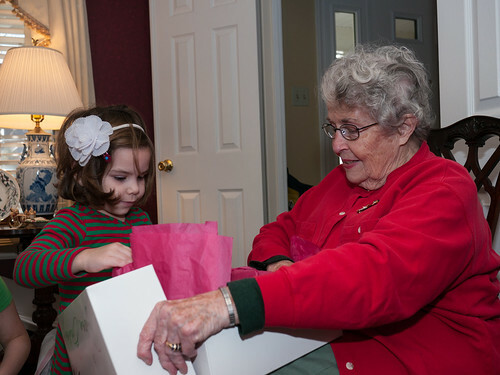 Leah was happy to be Grammy’s opening helper. Oooh, a serving plate for the Lanfords. I’m sensing a trend, here. 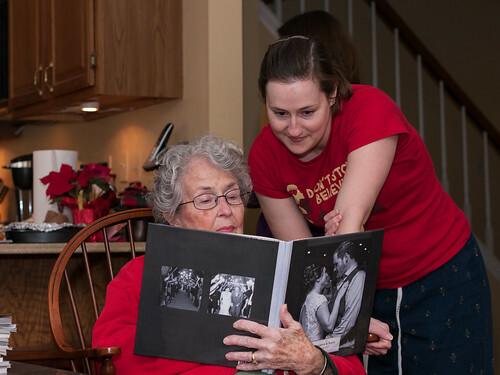 Aunt EA and Scott gave Grammy a photobook from their wedding, which she loved. 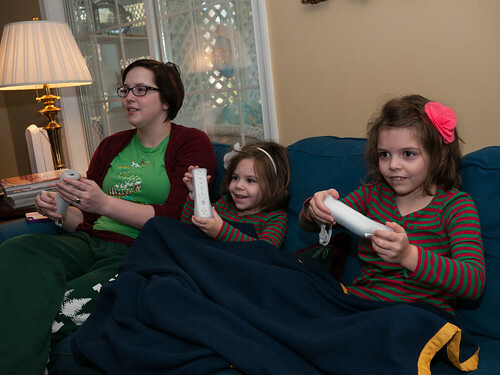 There was some traditional Christmas video game play. 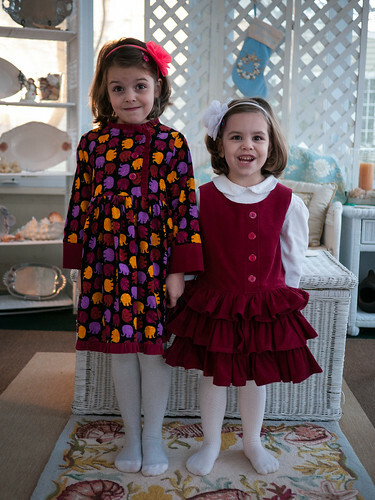 Jen surprised the girls with these two corduroy dresses that she’d been making in secret. Leah’s included so many ruffles that she ends up twice as big around as normal. 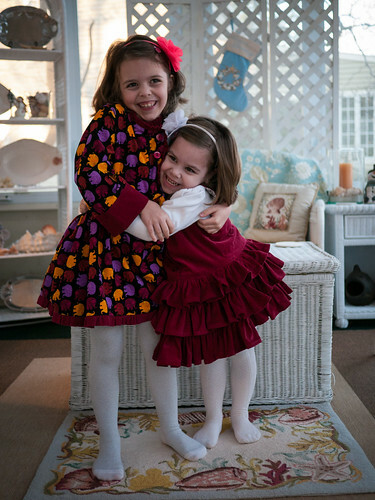 As usual, they were happy to pose with sweet simple smiles to model them. Can’t keep these two apart. It was then time to move onto Christmas dinner. The food and the company were great. 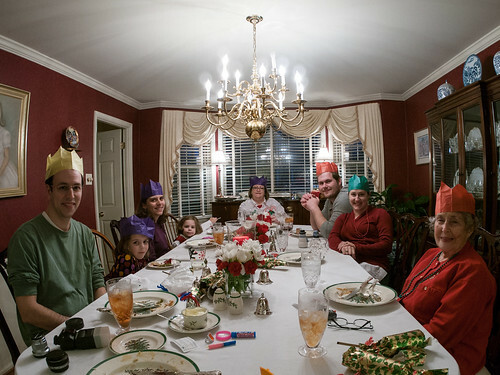 As usual, we had Christmas crackers, which is where the crowns came from. Note that Caroline was indeed here, but she’s behind the camera. Some of the Christmas crackers included paratroopers. The girls and Uncle Scott had fun with them on the stairs. These girls love their aunts. Leah’s been captured, and can’t escape Aunt EA’s kiss. 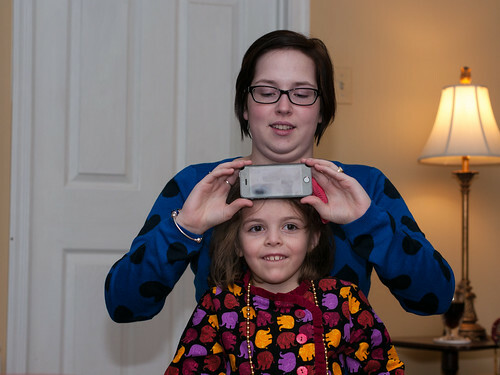 After an action-packed day, we played some Heads Up!. Molly loved to be the one guessing. 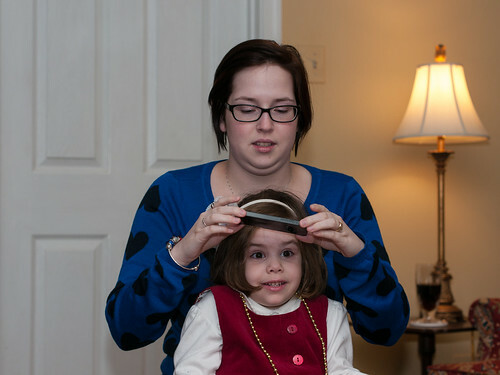 Thanks to Aunt Caroline for being her assistant. Generally when Leah would give an answer, she would say it as if she was just guessing. “Ummm… elephants?”. 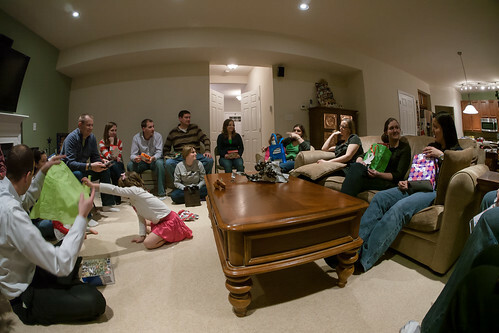 Christmas day was a great time of celebration. Sad that we have to wait an entire year for another celebration. What's that? We're immediately flying out to keep celebrating with more family? Well, that post will have to wait a day or two. It's Christmas Eve. 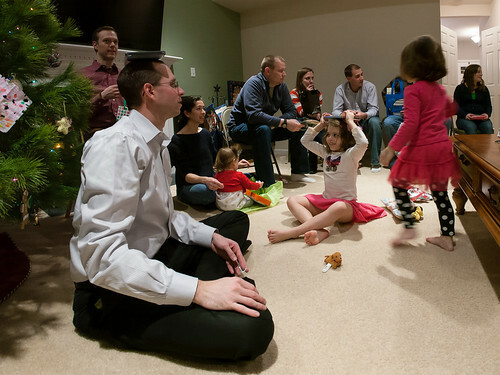 Celebrating with family, Santa, opening presents and more are all on the immediate horizon. 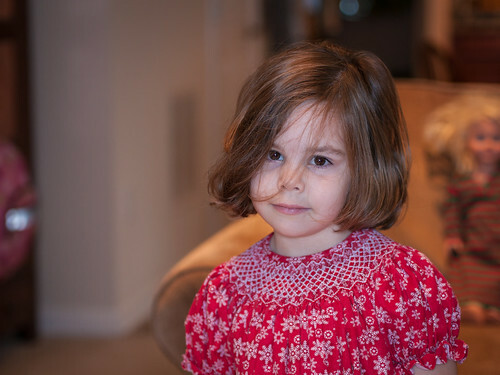 Despite the excitement, Leah remains serene. Here we are ready to head out to Christmas Eve service at church. Nice smile Molly. Molly and her choir sang twice at the Christmas Eve service. This first song went well, other than the worship leader getting confused and asking us to stand at the beginning of the song. The second song did not go so well, with most of the kids getting distracted. So, I'll just give you the first performance. 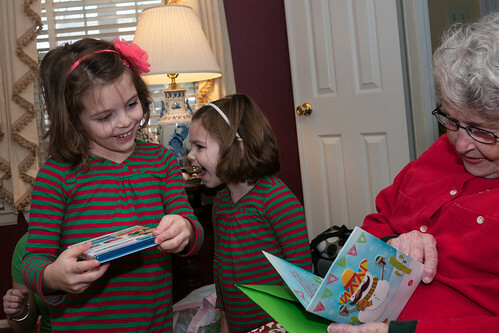 Per tradition, the girls opened one gift from Grammy on Christmas Eve. They were both very excited about their new jammies. 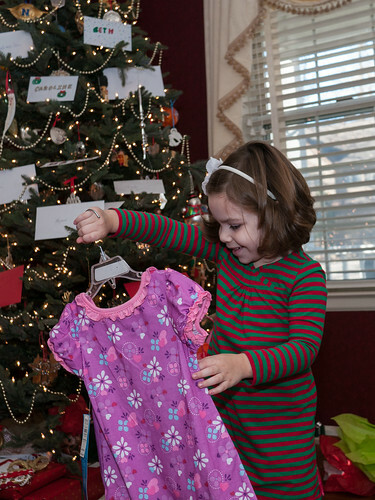 In fact, Leah was so excited about her jammies that she spent a large portion of her evening prayer thanking God for them. The girls put out cookies, milk, and carrots for Santa and his reindeer. The girls insisted on 9 carrots, since there are 9 reindeer pulling Santa’s sleigh according to the Rudolph song. After they headed to bed, we were busy finishing up wrapping presents. 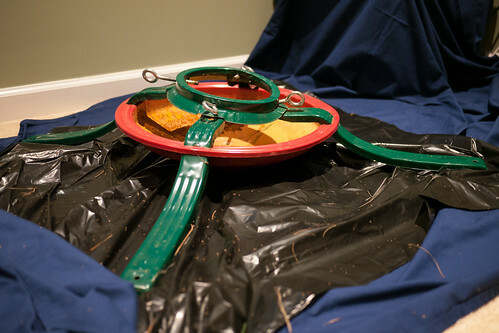 I also had to set up my project that I'd built for them, but you'll have to wait until tomorrow to hear about that. Our new house means we have more room for hosting. 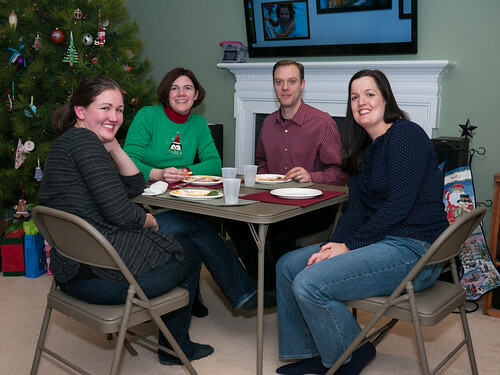 So, we were happy to volunteer (well, be volunteered - thanks Drew ;) to host our small group's Christmas party. With the addition of this card table, we had enough table space for everyone. 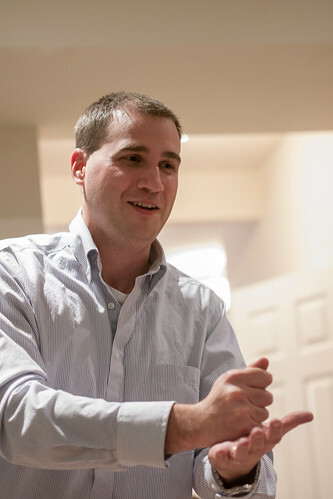 Molly and Leah loved playing with Mr. Andrew - our only bachelor attendee. Olive was the only little visitor we had. 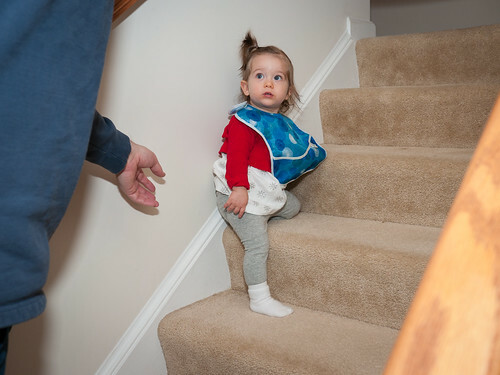 She loved our stairs, and wanted to climb them over and over. She eventually found Molly and Leah’s rooms and the mice (Mickey and Minnie) therein, which was even more fun than the stairs. 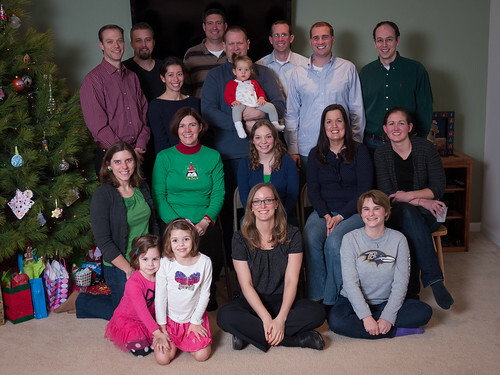 Here’s the whole group - well at least those who could make it to the Christmas party. 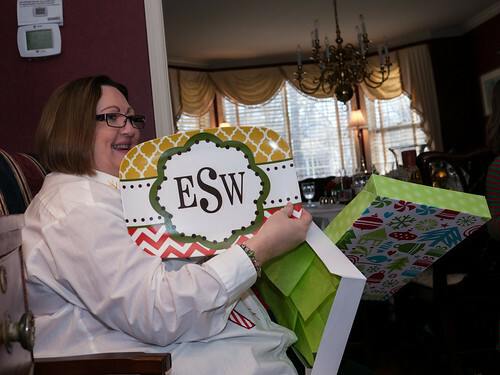 We did our gift exchange as well. In it, everyone gets slips of paper with instructions like “trade with someone of the same gender” or “everyone pass their gift 3 to the left” on them. Lots of fun. Mr. Andrew and Molly had fun playing balance movies on their heads. Tom's challenging someone to a game of rock, paper, scissors for their gift. Jen had to break out some mad thumb wrestling skills to keep her chocolate gift safe from Frank. It was great to share some fun with friends. Thanks to everyone who came. Merry Christmas! 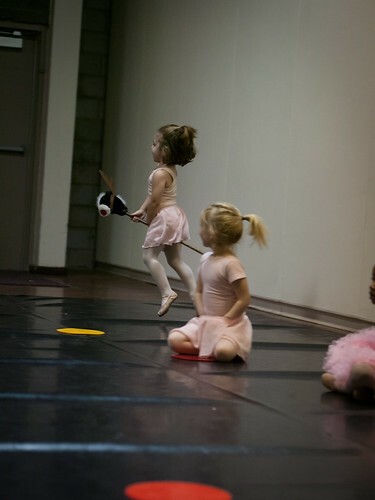 In addition to her newer activities, Molly’s still taking and very much enjoying ballet. We were excited to go to her class’ visitors day to see what she’s learned. 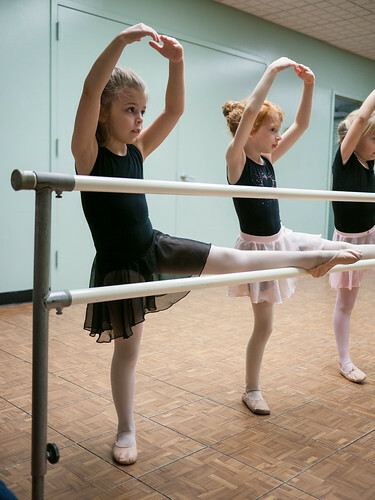 They do a lot of barre work in the beginning. We need a ballet dictionary (or at least this Wikipedia page) to understand all the movements she’s doing. I believe this is a Chassé. Here she is galloping. They even get props to help them understand what to do. And, of course, we got a lot of waves. Note that Leah is still walking on her toes most of the time. 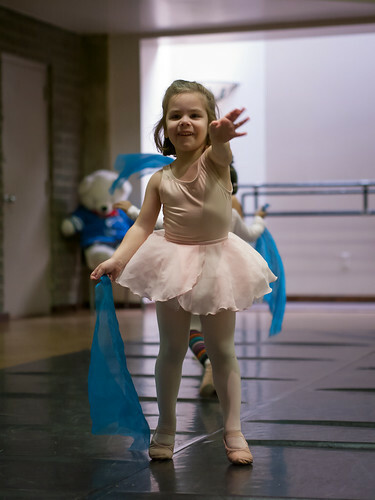 Ballet is the one place where she isn’t constantly told to walk on her flat feet :). 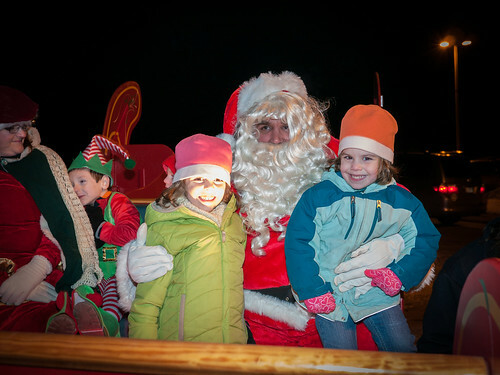 The fire department brings a Santa around in a sleigh to local neighborhoods. They stop at the pool by our house, so we braved the cold (it was just above 20) to go see him. 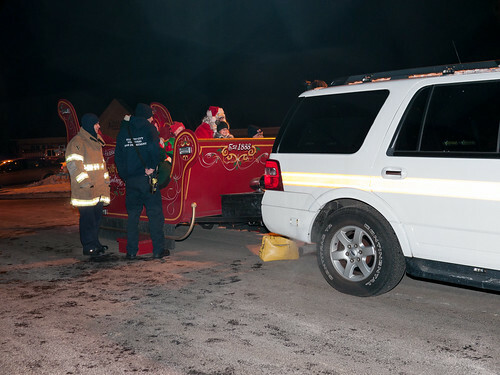 The sleigh was pulled by a fire department vehicle, which was led by a ladder truck. They drove through the neighborhood, though sadly not down our street. Shortly before heading to church yesterday, snow started coming down like crazy. Here’s Leah with her coat over her fancy smocked dress walking in through the snow. 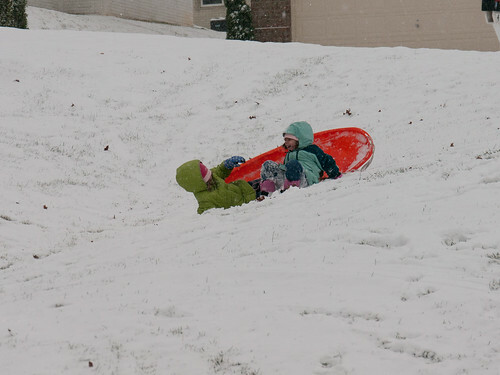 After church and a quick lunch, it was out to the backyard for some winter fun. 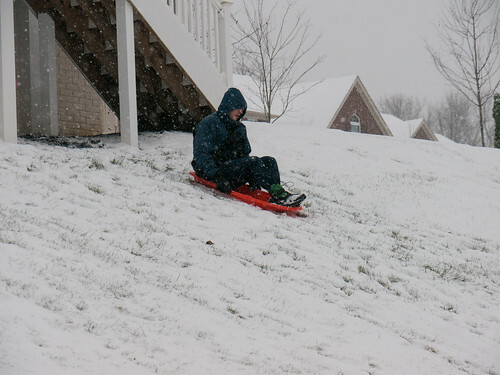 The house behind us to one side has a nice hill that runs into our side yard, which has a nice uphill to slow down the sled. The girls are ready to go. They fell over when stopping, but they’re having fun regardless. 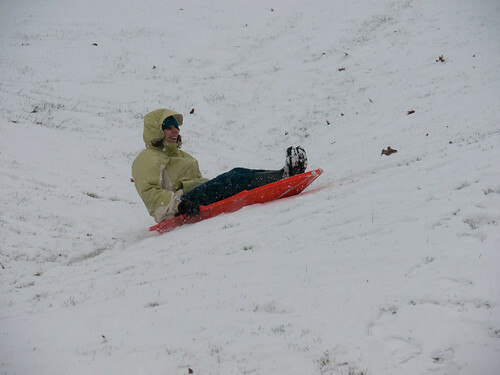 The girls sledded for much of the afternoon, but I did get a turn as well. 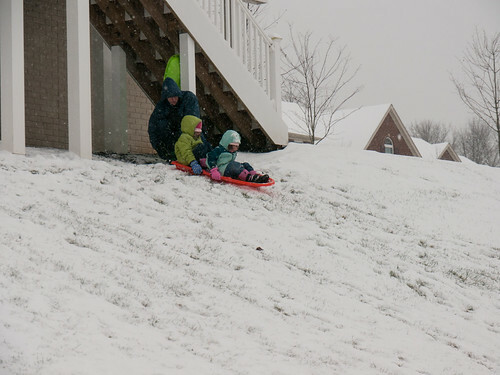 Even Mommy joined us (briefly) to sled down once. Looks like she had as much fun as the girls. After a good little while sledding and making snow angels, the girls were freezing. 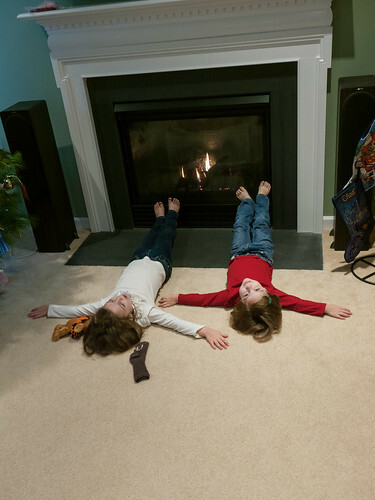 So, they headed in to warm up by the fire. After warming up, we headed back out for more fun. 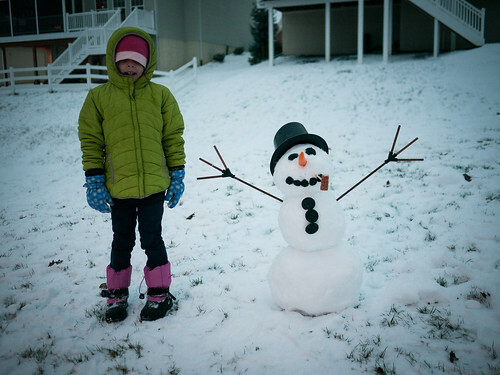 After a bit more sledding, we decided to make our first snowman. Leah went in shivering before it was complete, but Molly toughed it out till the end. Neither of us could feel our fingers for the last ten minutes, but we were determined to finish it. I think this was the most fun we've had in the snow. The girls are now old enough to really enjoy playing in it. After the last two years of very little snow, they were ready to get out and have some fun. I'll likely change my tune after a really big snowfall, but right now we're all really enjoying the snow. 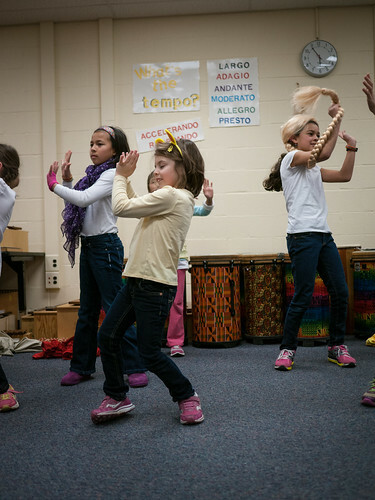 Molly's been doing ballet for several years, but this year she added a tap and jazz class. 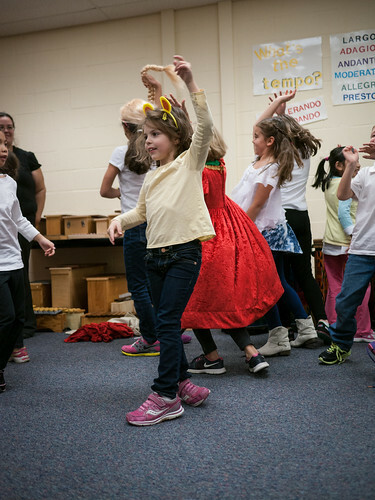 For their last class of the year, they invited parents and siblings to come see what they did in class. Molly's come a long way on all the skills and seems to especially love tap. She does a great job taking her turn, but I enjoy her "waiting patiently" for the others much more. Also, make sure you watch all the way to the end or you'll miss something (or someone). The year after the worst season I've ever seen, Auburn wins the SEC championship again. Great job tonight Michigan State. Thanks for giving us our shot at the title again. 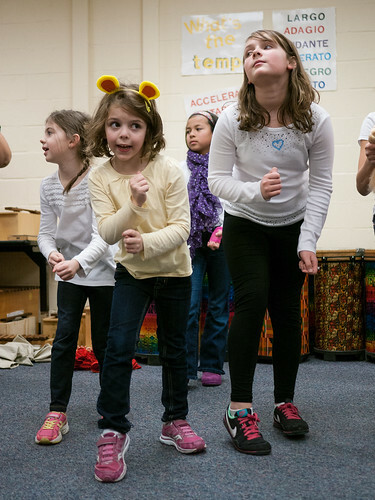 Molly's been taking a drama class after school and we were invited to their last class to see what they've done. 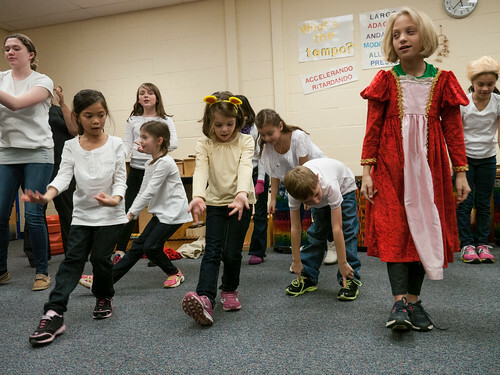 They've been working on a bunch of scenes from Disney theater productions. It included both musical numbers and dialogue. Molly had a great time, and we've been singing Disney songs ever since. 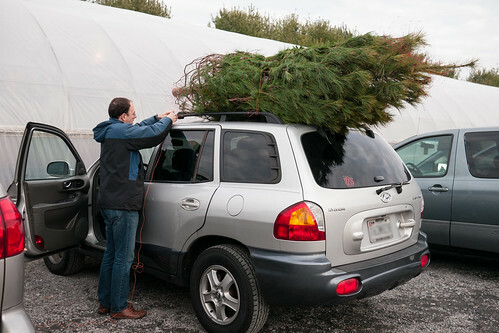 As we have in previous years, we headed to Greenway Farm to cut down our Christmas tree. 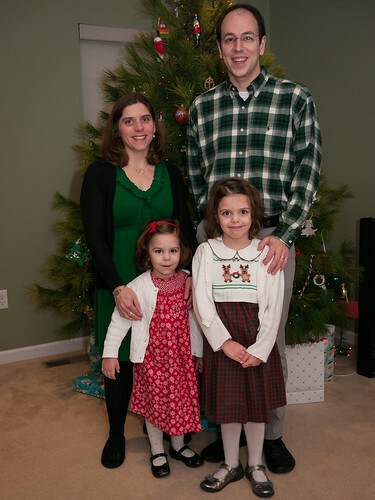 With the taller ceilings in our new house, we were looking for a taller tree than we've gotten in the past. 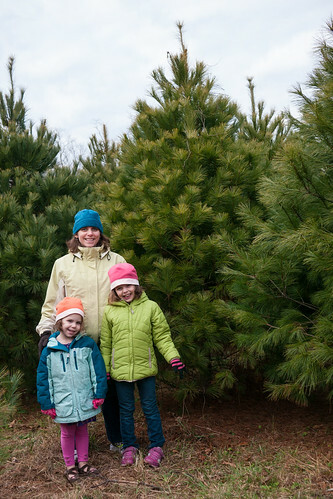 Fortunately, the farm had lots of very tall (up to 14 feet) white pines for us to choose from. 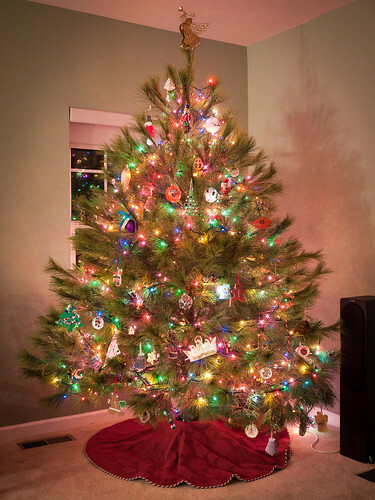 We chose this 10.5 foot tree, which gave us a little wiggle room to trim off when we got it home. Despite its extra height, it came down pretty easily. This taller tree hung off the back of the car a good bit. I had to drive very carefully on the way home, given all the speed bumps along the way. We put the tree in our old tree stand. We've been saying we should replace it for the past year or two, but we never got around to it. 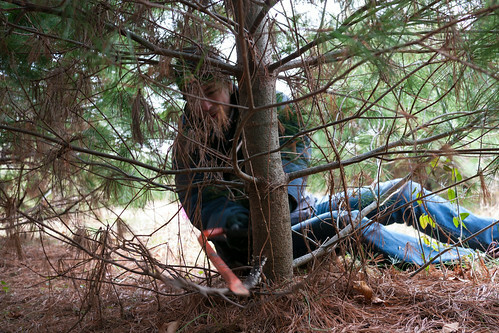 As I was tightening down the bolts, the tree tipped and fell with a huge bang. Our sad old tree stand couldn't handle this bigger tree. So, I hurried to Target to get a new stand. 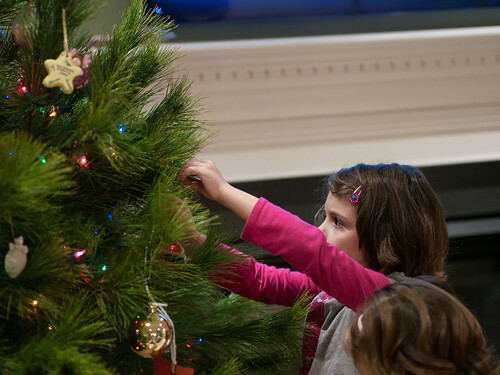 We had one evening free this week to decorate the tree, so we took advantage. Christmas music, lights, ornaments, and two very happy kids. A lot of ornaments made it onto the bottom of the tree thanks to the maximum reach of the girls. Thankfully, they were happy to let me lift them up to put ornaments a little higher. 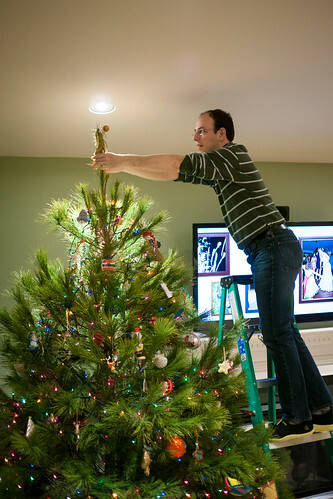 The taller tree meant I needed a ladder to put the angel on top, as well as some of the ornaments and lights up top. 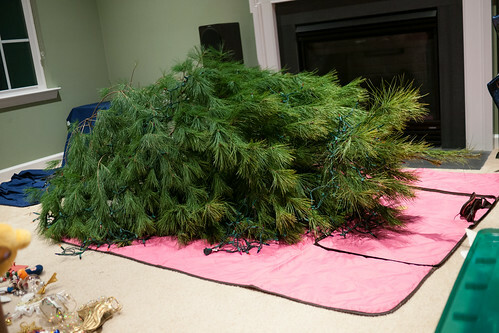 We finished with the tree and headed upstairs to give the girls a bath. Right after they got in the tub, Jen heard a crash downstairs. The tree had fallen over - again. 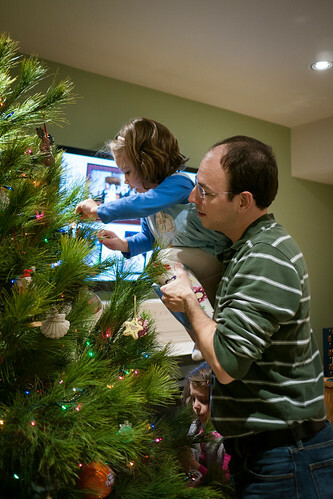 We quickly lifted it up to get the ornaments off. Thankfully, only a few of them had broken. We then set it back down while I ran to Home Depot to get another tree stand. This time it is one made of steel and stated to support 12 foot trees. After putting on the new stand, then putting the lights and ornaments back on, we have a tree. Please stay up.